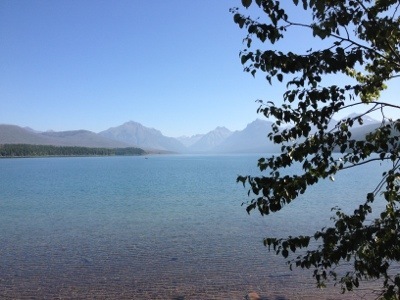 The view of Lake McDonald with the mountains in the background is my new iPhone wallpaper. That way I can take it with me. Apgar is the unusual name of the campground village on the edge of Lake McDonald where we started climbing the Going-To-The-Sun Road through Glacier National Park. If traffic stopped we could take a shower in this roadside waterfall. 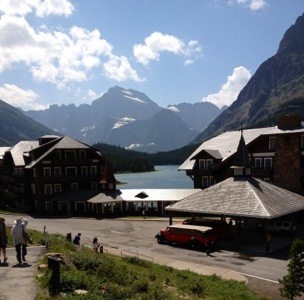 Many Glacier Hotel sits at the edge of a lake with mountains and glaciers in the background. Take a boat across and hike all day; return at evening for a great dinner in the hotel dining room. Dreaming, we have only a short stay here before continuing on to East Glacier Hotel at the southeast edge of Glacier Park. 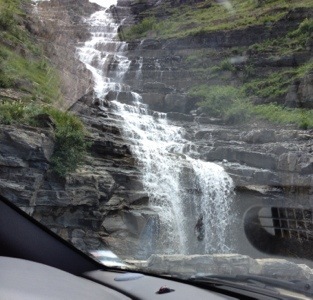 This entry was posted in Montana, Travel Blog and tagged Glacier Park, iPhone, Montana, Travel, Vacation by carto. Bookmark the permalink.